H: February 29, 2012: This past weekend I met up with Craig for part 2 of my bonefishing prep lesson. My double haul is now somewhat respectable, so it was on to the next order of business—learning to cast effectively in the wind and learning the speed/quick cast. When trout fishing on our small East coast rivers, wind plays a negligible role. You can easily alter your approach and presentation to adjust for it. But for the saltwater angler, the wind is the ultimate nemesis. Josée and I learned this the first time we went out for stripers and blues in Jamaica Bay. The wind ended up blowing 30 mph, and being novice fly anglers, it definitely got the best of us. Trying to beat the wind is a losing battle. But you can try to tame it. Saturday's forecast called for strong winds. Boy, were they on the money! Gusts of 60 mph and a steady westerly wind of 25-30 mph greeted us at Liberty State Park. But I wasn't deterred. Craig demonstrated strategies for casting with the wind coming from all directions. We covered every possible scenario. Having a decent haul helped immensely, as well as refining my technique to throw tighter loops. After 2 hours of practice, I found that I could make a decent cast in all but the strongest of gusts. And when I couldn't, I refused to get frustrated. I accepted the wind's victory...at least until the next cast : ). Besides, if it's blowing that hard on the flats, I won't need to make a long cast. We won't be able to spot a fish more than 30 feet out. Lesson learned: harness the power of the wind when you can and use the speed of a haul to tame it. Craig has generously offered to lend me one of his #9 rods. I'm a very lucky girl, blessed with not one but two fly fishing fairy godfathers (Craig and Antoine ; ). I feel a bit like Cinderella, heading off to the Bonefish Ball with her borrowed finery. Hopefully, I will meet, get to dance with, and land my Prince—a handsome, 10 pound bonefish—before the strike of midnight! After the lesson, we drove over to Tight Lines to pick up the rest of my gear for the trip. The shop was pretty crowded. There were a few other customers but also a group of about 5-6 men sitting around a table and it looked like they had been parked there for a while—the "fly shop groupies". I'm sure this same scene plays out in shops all over: a congregation of diehard fishermen escaping spouses, families, and domestic obligations; chatting about the latest rods and gadgets; swapping fly recipes; retelling the same old fishing stories over and over again; killing time... "Honey, I'm just running out to the shop to pick up a few feathers. Need anything?..." Then 6 hours later they return home. 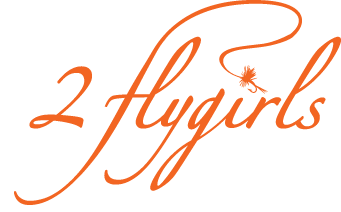 Excuse the intrusion, gentlemen, but a flygirl needs to get her fix too! It was great being able to go beyond the wiggle test (the major drawback of Manhattan fly shops). I cast a few rods behind the store, developed a crush on one of them, bought another bonefish line for the #9 rod, plus all the fixins to make some bonefish leaders. I watched Dave skillfully and meticulously tie a bimini twist/double loop with my new gel spun backing. I have to admit it was pretty cool and a very fun day! Before I knew it, I was running late for dinner. God, I hope 10 years from now, I'm not a fly shop groupie... ; ), although the odds are not in my favor. H: February 13, 2012: 6 weeks till I head down to Andros island in the Bahamas for my first taste of bonefishing. I've been reading everything I can find on the internet about bonefish—their physiology, behavior, habitat, as well as gear requirements and strategies for catching them on the fly. I definitely have my work cut out for me! 6 weeks to get comfortable with an 8 weight rod, master the double haul on it, and pickup some tips for casting in heavy wind and casting quickly with minimal false casting. Oh, and while you're at it, throw in some new knots to learn so that I can make my own bonefish leaders and tie on my flies with a rapala knot. A couple of weeks ago, Josée and I met up with fellow Juliana's Anglers, Shannon Brightman (our president) and Marcy Beitle for dinner. We hadn't seen either of them in over 9 months! It was a fun evening—good food, wine, company, and naturally lots of fly fishing talk. Well, it turns out that Shannon was in my shoes last winter. She was going on her first bonefishing trip in the spring and had 2 months to prepare. Every weekend, regardless of snow, sleet, or frigid cold, she went out to Chelsea pier with her new 8 weight rod and practiced casting. And that practice paid off. She caught her first bonefish on Andros with a gotcha fly that she tied herself. Shannon, you are a kindred spirit! I too, have been practicing on the weekends with my 5 weight. Except for this past weekend (brrrrrrrr! ), the weather had been cooperating. But Sunday morning, with wind chills in the single digits/low teens, I grabbed my new loaner 8 weight rod (merci beaucoup, Antoine! 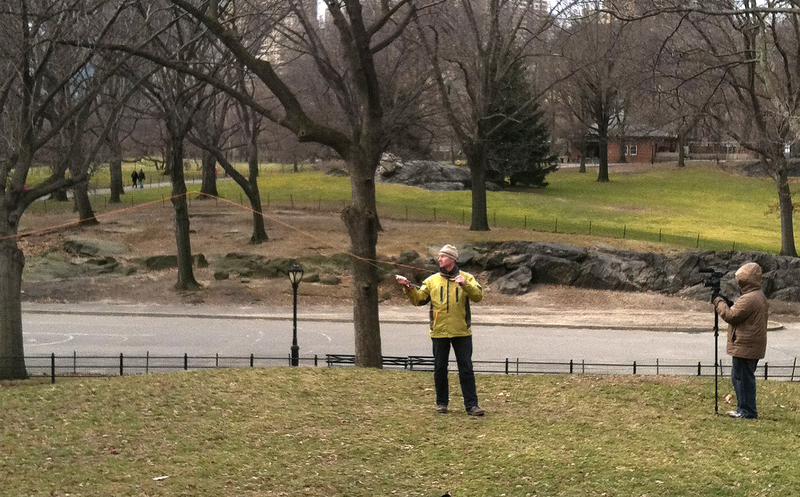 ), bundled up, and went to Central Park to meet my good friend and FFF certified casting instructor, Craig Buckbee. He was being videotaped for an upcoming issue of So Fly magazine, a new all-video online fly fishing magazine that's the brainchild of Aaron Jasper and Justin Massimo. Apparently they met about 5 years ago on a river. Justin was a novice fly fisherman and wasn't having any luck that day on the Raritan. Aaron came wading down river, catching fish left and right. He gave Justin some pointers and they have been friends and business partners ever since. I was Craig's student for the shoot, getting a lesson on improving my double haul. With 4 layers on, I felt like I was headed to the ski slopes rather than a casting session. Justin and Alex (the camera guy) were so low key/inconspicuous, that I almost forgot about the shoot (except for the times when I whacked Alex with my line ; ). Craig was his ever patient, methodical, encouraging self. I'm looking forward to seeing the video footage of him and will post a link when it's available. Meanwhile, I can definitely say that the lessons and practice are paying dividends. The 8 weight felt surprisingly comfortable in hand and the timing on my double haul is improving every week. Now, back to leader formulas, knots, and getting the rest of my gear in order.